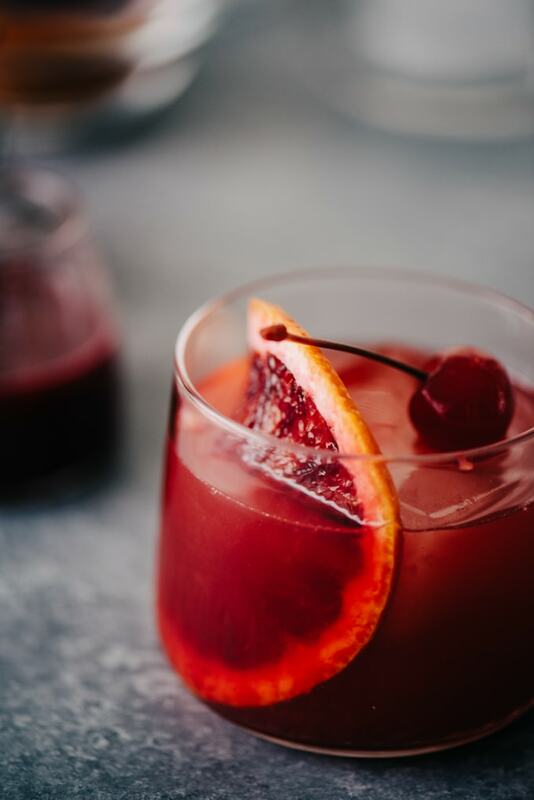 It’s the winter that will never end, and this blood orange bourbon sour is the best way to sip your way through it! 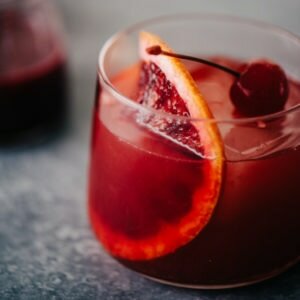 Instead of fighting the lion, let’s celebrate winter’s best flavors with this sweet and bitter blood orange cocktail. The first day of spring welcomed us with giant, frigid arms and buckets of snow. “In like a lion, out like a lamb”? Please, yes. The upside to mid-week snow days is that it’s completely acceptable to cozy up with books, blankets, and a blood orange cocktail while you put off everything else (and if you’re doing that on non-snowy days too, I salute you). Blood oranges are a tricky citrus. They taunt you with their gorgeous crimson flesh and variegated speckled rind, but then you take a big bite and….hello bittertown. Like March, they need to be tamed. For salads, I like to salt slices of blood oranges to draw out the bitter and reveal the sweet. But drinks are a different story. Bitter cocktails like the Negroni, Old Fashioned and Boulevardier are enjoying quite the renaissance, and I’m only too happy to indulge in that trend. 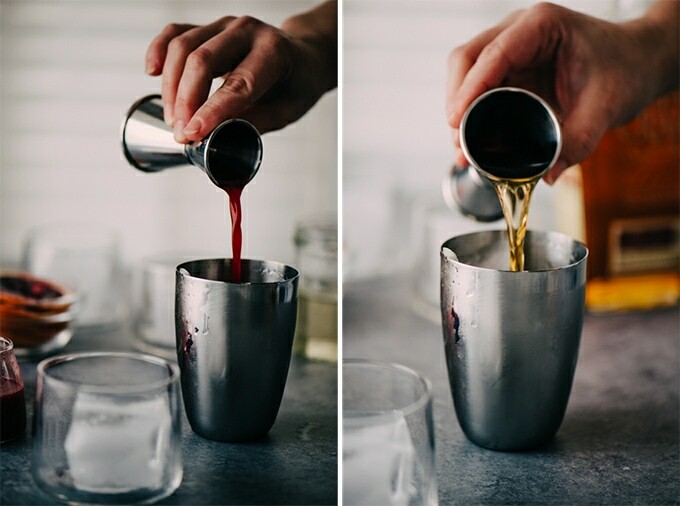 A blood orange cocktail is the perfect way to celebrate the sharp sour notes of fresh blood oranges, and the bourbon sour is a natural companion. Let’s get sippin’, shall we? Pin it now! 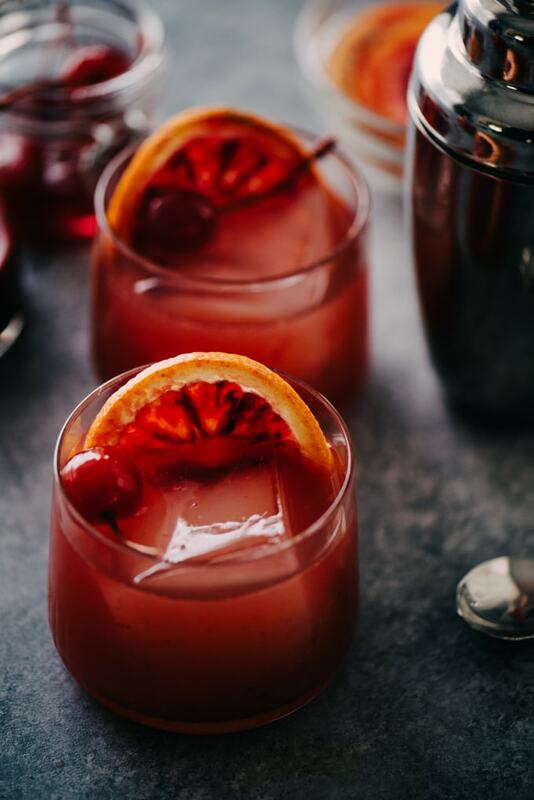 Click here to pin this Blood Orange Bourbon Sour to your cocktails board on Pinterest. This blood orange cocktail is as straightforward as they come. Stir, pour, garnish and sip. It doesn’t get any easier than this. You’ll need an ounce of fresh squeezed blood orange juice for one cocktail. Give the blood oranges a little roll on the counter to break up the flesh and release the juices. Then slice in half and use a reamer or the tines of a fork to juice the orange into a small bowl. If you’re making these cocktails for a crowd and need a large volume of fresh juice, we love our electric citrus juicer. Our liquor of choice for this cocktail is bourbon, specifically Elijah Craig Small Batch Bourbon. It’s sweet and smokey, and a natural foil for it’s sour cocktail companions. It’s also widely available, and it won’t break the bank. Pour the blood orange juice, bourbon, and some sour mix into a cocktail shaker, stir, and pour over ice. I make homemade sour mix using simple syrup (see recipe notes), lemon juice, and lime juice in a 2:2:1 ratio. For ease you can certainly use pre-made sour mix, but know that it’s sweeter than the homemade stuff. Cam and I love these giant ice cubes for bourbon-based cocktails in particular, where you want to be able to slow sip and enjoy the cocktail without a ton of dilution. I garnish these guys with a slice of blood orange and a maraschino cherry. You have my permission to skip the orange slice, but do keep the cherry. Not only is it classic, but eating that guy after it’s marinated in a blood orange cocktail for awhile is literally the cherry-on-top delight. PIN IT NOW, MAKE IT LATER! 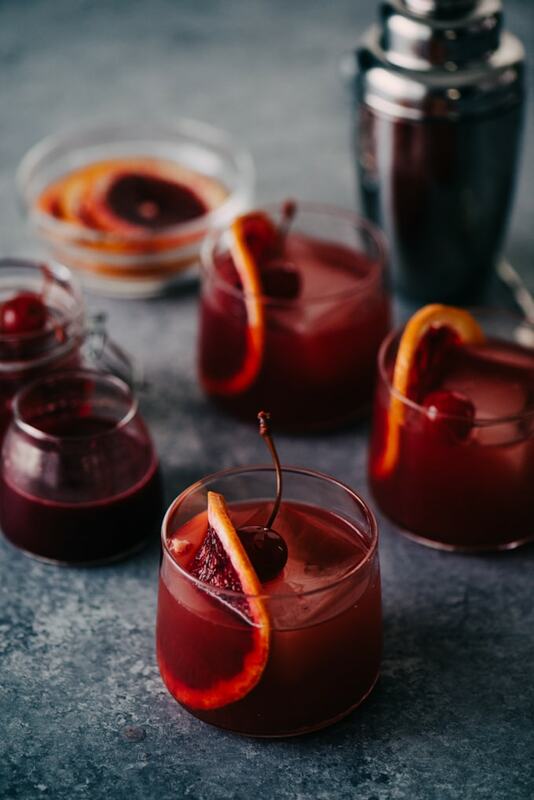 CLICK HERE TO PIN THIS BLOOD ORANGE COCKTAIL. 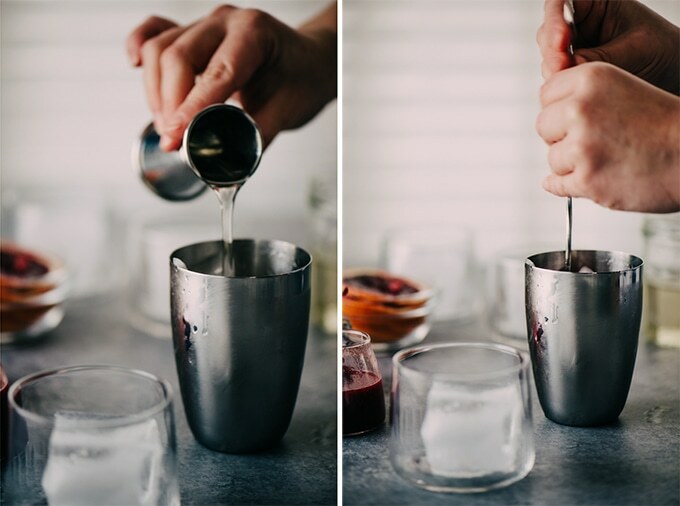 A blood orange cocktail is the perfect celebration of winter's best cocktail flavors. 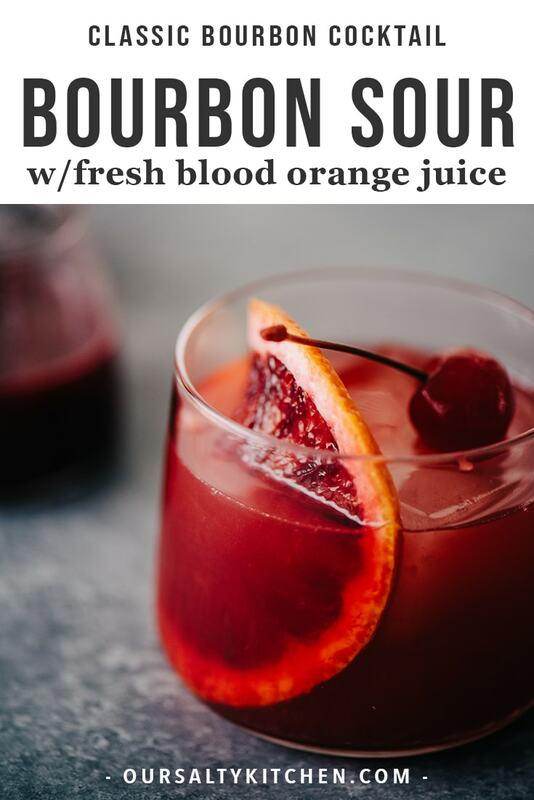 Embrace the sharp, sour notes of fresh blood oranges paired with smokey, sweet bourbon with this blood orange bourbon sour. Roll a blood orange back and forth on a cutting board a few times to break up the flesh and release the juices. Cut the orange in half, then juice using a reamer or the tines of fork. Fill a cocktail shaker with ice. 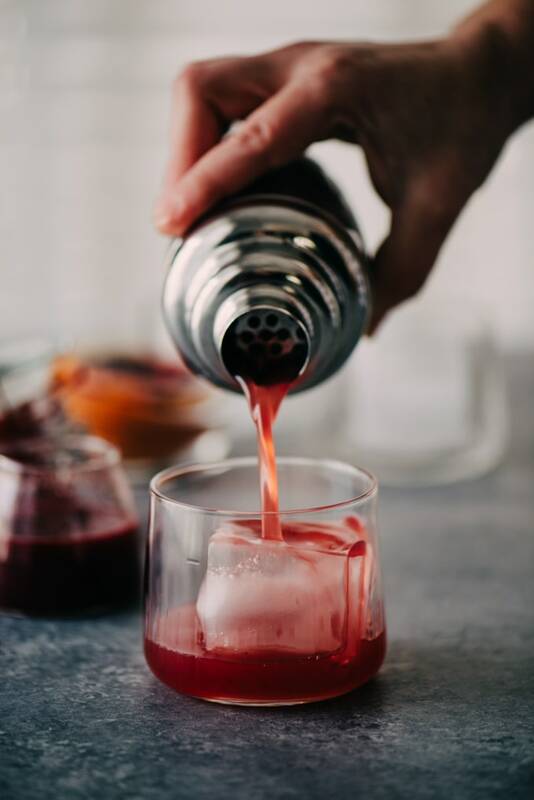 Pour 1 oz blood orange juice, bourbon, simple syrup, lemon juice, and lime juice into the shaker. Stir until the shaker frosts. Place 1 large ice cube into a cocktail glass. Pour the blood orange cocktail into the glass and garnish with a blood orange slice and a maraschino cherry. Combine 2 parts sugar to one part water in a small saucepan and heat over medium high heat, whisking frequently until the sugar is dissolved and the solution is clear. Remove from heat and cool. Simple syrup keeps in the fridge in a sealed container for at least 2 months.